Discussion in 'Colored Gemstones' started by TheGarnetGirl, Jan 10, 2019. I made an earlier thread asking your opinion of a prospective emerald, which I ended up purchasing and loving! I ultimately wanted to cut costs and save some money and also get some more experience with gem setting by purchasing a pre-made setting that I could set the emerald in myself but I actually found a little local bench who created a setting for a much better cost. For that price, I'm quite pleased with the outcome and believe that it will become a staple in my jewelry rotation and my everyday emerald ring. Time for some snaps of my lil' jewel! & I swear its so difficult to take an accurate photo of any emerald. This one is pretty true to photos although it's less a jade color and more bluish green- which I adore. Arkteia, MeowMeow, westjenn and 24 others like this. I remember this stone, and I'm so glad you ended up getting it. It looks wonderful. Thank you! Since everyone helped in the decision making process I thought an update with pictures was in store! MissyBeaucoup and SouthernGent like this. Oh my god! I have literally been craving for a 7mm round cab emerald in a bezel setting! This is like a complete visualization of what I had in mind! Do you mind sharing where you got this cab? I have been looking for a cab like this all over, it's so difficult to find a round one in that size! Very pretty. Looks beautiful on your hand! My momma raised the most frugal person out there. I'm nuts with saving money...even though for where I live and for people who dont understand the jewelry obsession or collecting they think I spend quite a little fortune on jewels....i just give up and dont mention or answer cost questions anymore from friends or family as they dont get it. When I heard that hed charge me almost the same amout that the stone cost I knew it was meant to be! MissyBeaucoup, SouthernGent and ChickityChicken like this. What a bargain! And it's gorgeous!! May baby over here! This is stunning! Ooh, I like that! I never used to like cabs. But I've bought a couple this year ( one for sis, one for me), now I love them! That is a beautiful color on that emerald. I'm a may baby too! Looks wonderful on you! Its such a classic and the color is beautiful. It’s so nice that you have seen this project ( and others) through to completion. It’s very much like a story, with such a satisfying and happy new beginning... that stone has a platform now to be worn and loved. So pretty and it really looks good on your hand. love emeralds with gold metal. Aww thank you everyone for your sweet compliments! Emerald has felt like such a soul stone for me and I dont see my love for it or desire to collect more ending anytime soon. MissyBeaucoup, 2Neezers and Bluegemz like this. What a vibrant and glowing colour! Your ring is stunning. I love that you have kept the setting relatively simple to allow your stone to take center stage. Beautiful! Thank you all again! Youve made my week seeing as you appreciate my little gem as much as I do. I'm still wearing it and seeing its personality shine in various lighting. It goes from a bluish rich jade color to a very crystalline blue gem with a dash of green. I took this photo this morning and its the color that I see in artificial light. bludiva, MissyBeaucoup, strawrose and 2 others like this. Is it open in the back? Can we see back and profile shots? Pretty please? I want to see how it's constructed. I'm always interested in the "anatomy", so to speak! TheGarnetGirl, suzanne2 and 2Neezers like this. Oh I know exactly what you mean! I'm sure when you make your own jewelry you're even more keen on seeing how a piece was put together! Ahh I cannot wait to start! It is a very simple bezel setting with the back being completely closed. Its like a little bezel cup that was soldered onto the band which has this little floral pattern on it. While it could definetely be stacked I will be wearing her on her own. The back is quite boring but I can try to take a few shots tomorrow when my fingers have gone down and I dont have to get the vaseline and rip her off of my finger. I went hiking in the snow today and got my blood pumping like crazy so my fingers are quite swollen and taking it off wouldn't be the funnest thing haha. 2Neezers, MissyBeaucoup, stracci2000 and 1 other person like this. What a lovely side profile! I like the idea of a floral design on back. I know what you mean. It’s hard to find the sweet spot for rings. It’s either a spinning band or you are trying to rip it off a sausage finger. TheGarnetGirl and MissyBeaucoup like this. Emeralds and yellow gold are made for each other, don't you think? That emerald looks like a sweet little piece of hard candy, good enough to eat! It is absolutely adorable and what a great total price you put it together for. You deserve it for putting in the work! Wow, pretty amazing considering the price, really pretty regardless of the price! Is the emerald from an online seller? Marvelous glow on that beauty. Well done and the price cannot be beat. Absolutely gorgeous—especially on your pretty fingers! I love the rich gold and engraving. Enjoy it in good health! You deserve bonus points for making such an expensive-looking ring for a song! Please post it on the “under $1250” thread too. So pretty, love that emerald glow! What an awesome everyday ring! 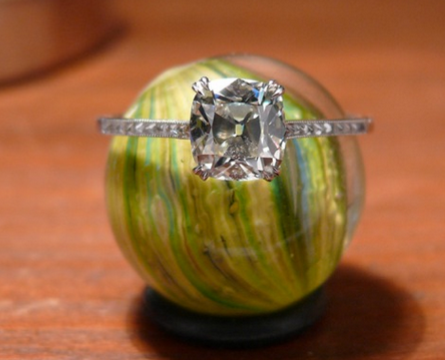 Are you substituting this one for your engagement emerald? Have you set that one yet?